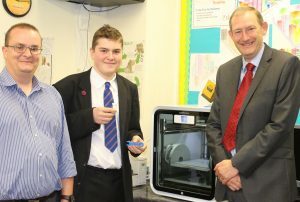 Mr Alex Taylor and Red House pupil try out the latest 3D printer with Engineer (pic left) from Smart Office Systems Ltd.
Red House pupils gave visitors to our Open Morning a glimpse into ‘tomorrow’s world’ with the arrival of our new 3D printer. The printer, a CubePro Duo, is the latest specification 3D printer, representing the most up-to-date 3D printer technology. It prints using a range of different plastics with numerous colour combinations available. The 3D printer will allow Red House pupils to work on projects that require a higher level of thinking and evaluation skills. Children would normally sketch a model and then make that model using card. 3D printing allows them to assemble and physically handle an accurate and detailed version of their designs. The printer comes pre-loaded with a wide range of 3D models, but importantly it has design software that allows pupils to create their own three dimensional products. 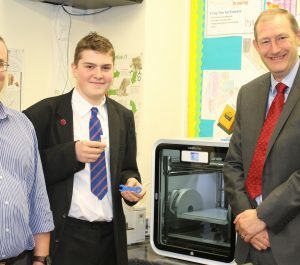 Mr Wilkinson, Head of Design and Technology, says the investment in 3D printing will bring benefits throughout the school and will not just be limited to the Design & Technology department. “The benefits for pupils and teaching are endless with 3D printing. It can be used in other areas such as printing models of mountain ranges in geography or printing model hearts or joints in biology”. ‘3D printing is set to revolutionise the way that we live, ensuring pupils have access to this technology, at its inception, will enable them to be at the forefront of this next technological revolution’.